The Go-Grow System is the definitive self-watering pot system, requiring minimal upkeep and engineered to provide maximum yield and versatility. Designed with modularity at its core the Go-Grow can be used as a single unit or extended for multiple systems from the same nutrient tank. Fill the pots with coco coir, a mixture of coir and pebbles or your choice of media and the Go-Grow will monitor nutrient levels at the base of the container and ensure enough nutrient is available to the plant. The success of indoor cultivation in a house or apartment is based upon a simple principle: reproducing the conditions of the outdoors indoors. The benefit of using Go Grow systems as part of hydroponics is that the cultivator has precise control of the parameters needed for a plant to develop, reproduce, fruit and flower; without the need for significant construction and the threat of external influences (such as weather and pests). 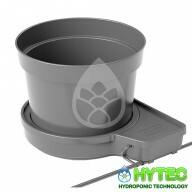 All of the Grow Systems and Spares available from Hytec Hydroponics have been tried, tested and are trusted by hydroponic experts. Our propagation tents are covered in durable and robust canvas, so as to be entirely hermetic to outside climatic conditions. The interior of the tent is lined with highly reflective material, usually Mylar, but it can also be aluminium or the highly reflective white Orca covering. GOGRO 15L MODULE The GoGro System is the definitive self-watering pot system, requiring minimal upkeep and engineered to provide maximum yield and versatility. Designed with modularity at its core the GoGro can be used as a single unit or extended for multiple systems from the same n..
GOGRO 25L MODULE The GoGro System is the definitive self-watering pot system, requiring minimal upkeep and engineered to provide maximum yield and versatility. Designed with modularity at its core the GoGro can be used as a single unit or extended for multiple systems from the same n..